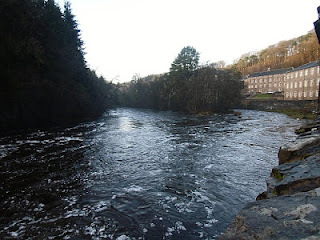 The Scottish Wildlife Trust in New Lanark had organised a walk round the Falls of Clyde Reserve followed by mulled wine and mince pies afterwards at the visitor centre today so I joined in the fun. The cold weather has gone for a while and it was much milder and sunny today. 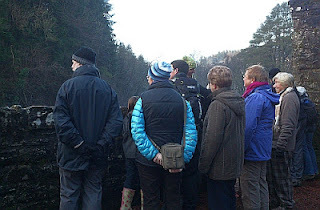 A group of us met up at the visitor centre and walked to the Falls of the Clyde. These are spectacular falls a bit like the Victoria Falls, only on a smaller scale and were described by poet William Wordsworth as “the Clyde’s most majestic daughter” after a visit in 1802. JMW Turner painted the Falls between 1844 and 1846. Sir Walter Scott and Samuel Taylor Coleridge were also visitors to the area. The path around the Falls is well marked and not too muddy, although there is a steep climb to the viewing area at Cora Linn.On the way there we passed the nursery where the Trust is establishing trees from seedlings and replanting in different areas of the reserve. 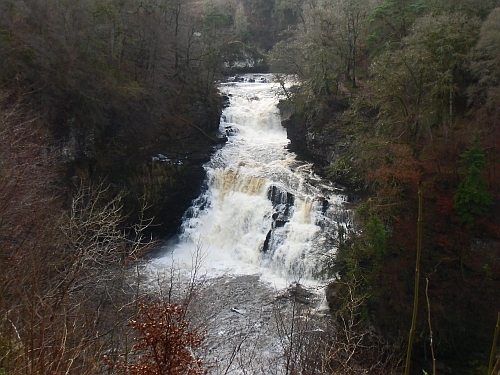 The Falls of Clyde provides suitable habitat for badgers, roe deer and over 100 species of bird. From March to June the area site is well known for its resident breeding pair of peregrine falcons which are protected during the breeding season by Operation Peregrine which provides security for the birds. The River Clyde is suitable habitat for Otters and Kingfishers. The water level of the River Clyde was very high due to the high levels of snow and rain which had fallen in the previous weeks. This made the view of Corra Linn spectacular. Winter is a good time to view it because of the high levels of water at this time of year. At other times the water may be reduced to a trickle when there has been a dry spell. 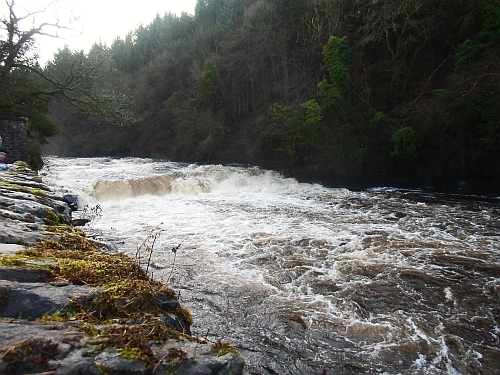 Water is also diverted to the hydro power station at Cora Linn for the generation of electricity so this also can have a significant effect on the water level. After admiring the falls at Corra Linn we walked back to the visitor centre for mulled wine and mince pies. The visitor centre will be closing on Christmas Eve and not re-opening until the end of March 2013. When it re-opens there will be no shop but there will be a large educational room for lectures and talks.